BACKGROUND: In the immediate postoperative period surgical breast cancer patients can face many problems including functional limitation of the shoulder, edema, pain and depression. Although those symptoms can alleviate during the stages of the therapeutic route, most of the time concur significantly to the everyday life discomforts decreasing sharply the quality of life. Therefore, is essential to pay attention to the functional problems of breast cancer patients in order to ensure a quick and complete physical and psychosocial recovery. 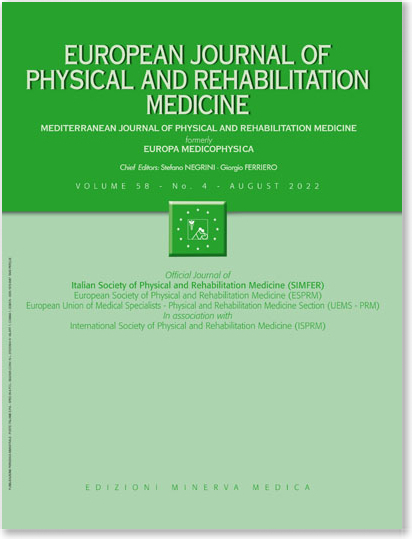 AIM: Aim of this study, comparing 2 groups of patients, one that underwent to early physical rehabilitation program (EPRP) and one as a control group, is to evaluate: functional improvements of the glenohumeral joint mobility, antalgic effect of EPRP, improvements and/or worsening of quality of life. SETTING: Inpatient and outpatient clinic, Breast Unit, “San Giuseppe Moscati” Hospital, Avellino, Italy. POPULATION: Seventy women planned for Madden’s modified radical mastectomy or for segmental mastectomy with axillary dissection in the period from March 2010 to February 2011. METHODS: Patients were randomly assigned to treated and control group. All participants were evaluated before surgery and postoperatively at fifth day, first, sixth and twelfth month. Patients of the treated group, underwent first, to assisted cautious mobilization of hand, wrist and elbow and after drainage removal, to twenty physiotherapy sessions under the guide of a physiotherapist. RESULTS: Within group statistical analysis evidenced that TG regained normal function at 1 year after surgery while CG was unable to do so for flexion, abduction and internal rotation movements. TG manifested general and statistically significative improvements in QoL. Improvements in the grade of pain perceived were observed starting from the first postoperative month. CONCLUSION: Postoperative early physical rehabilitation programme in surgical breast cancer patients surgically treated significantly improves glenohumeral joint mobility, reduces pain and widely improves the quality of life. CLINICAL REHABILITATION IMPACT: Early rehabilitation plays a key role in the physical and psycho-social recovery for breast cancer patients surgically treated with axillary dissection.